モルダウ モルダウ Bedřich Smetana - Ma Vlast - Vltava "Moldau"
故郷　フルートソロ 故郷 故郷　(ふるさと)　Japanese FolkSong "Hurusato"
Mozart Flute Quartett C dur K 285b 2'nd & 3'rd Movement with a Music Minus One CD accompaniment. Mozart Flute Quartett C dur KV 285b First Movement with a Music Minus One CD accompaniment. The effect of OverDrive was added to the sound of the flute. "Air on G String" from "Orchestral Suite No. 3 in D major, BWV 1068"
第ニ楽章　シチリアーノ 2008.11.24 live　@ Ritto Center for Fine Arts"SAKIRA"
Menuet Variation L'Arlésienne Bizet アルルの女 メヌエット 変奏曲 アルルの女 メヌエット 変奏曲 Minuet (Variation ) from L'Arlésienne by Georges Bizet. 最北端の地　稚内 CAN YOU CELEBRATE? 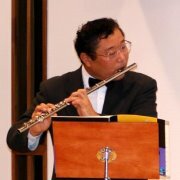 G.Faure - Apres un Reve by Flute フォーレ 夢のあとに フォーレ 夢のあとに 2008.11.24 live　@ Ritto Center for Fine Arts"SAKIRA" Japan Shiga pref. Die Moldau (Smetana) モルダウ　スメタナ 我が祖国より フルート演奏 モルダウ　我が祖国より 2008.11.24 live　@ Ritto Center for Fine Arts"SAKIRA" Japan Shiga pref. タイスの瞑想曲 2008.11.24 live　@ Ritto Center for Fine Arts"SAKIRA" Japan Shiga pref. Mozart　Andante in C major　k. 315　モーツアルト　アンダンテ Classical Flute Mozart　Andante in C major　k. 315 2008.11.24 live　@ Ritto Center for Fine Arts"SAKIRA" Japan Shiga pref. Copyright (c) Huehuki Kazushi Shiga All Rights Reserved.